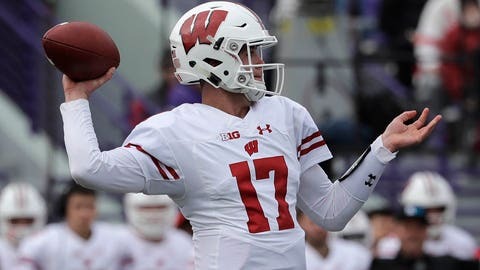 MADISON, Wis. — Wisconsin is getting backup quarterback Jack Coan ready to play this weekend at No. 21 Penn State with starter Alex Hornibrook listed as questionable because of another head injury. Hornibrook was in the concussion protocol for the second time in three weeks after getting hurt in last week’s 31-17 victory over Rutgers. Hornibrook’s head hit the turf after being sacked on the last play of the first half. Coan was 20 of 31 for 158 yards and a touchdown in a 31-17 loss at Northwestern two weeks ago, which was his first career start. The Wildcats held star running back Jonathan Taylor to 46 yards on 11 carries. Coan, a sophomore, was 5 of 7 for 64 yards and a score in relief of Hornibrook last week. Hornibrook, a third-year starter, struggled in the first half and tossed two interceptions. The Badgers may need to prove that they can move the ball through the air with Coan against a tougher defense on the road, though they also successfully ran the ball for all 13 plays of the third quarter against Rutgers. A loss this weekend for the Badgers (6-3, 4-2 Big Ten) would hurt their already tough chances to win the West Division after the defeat at Northwestern knocked them out of first place.